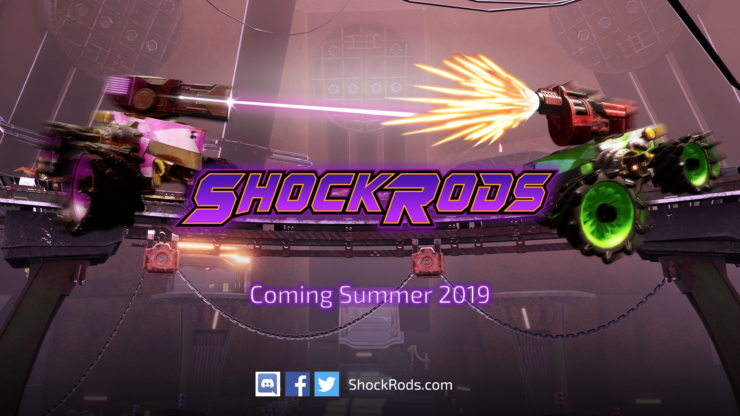 Stainless Games, the developers behind the Carmaggedon series, announced their new IP ShockRods. The game, a vehicle multiplayer game that’s all about mayhem and destruction, is set to debut in the Summer on PC via Steam Early Access. Players will get their first hands-on at EGX Rezzed in London, though, from April 4th to 6th. Stainless Games are back with a brand new IP featuring all the over the top, in your face vehicle combat that you have come to expect from this world class dev studio. ShockRods is a 6v6 or 12 player free-for-all arena shooter, bringing all the blisteringly fast-paced action, mayhem and overpowered weapons you would expect. ShockRods draws inspiration from the classic “kill or be killed” arena shooter greats of yesteryear with over the top weapons, explosions and insane mobility, but with a twist – the titular ShockRods; these customisable, hulking, technologically advanced vehicles, equipped with nitros and the ability to double jump, allow for truly thrilling and action packed gameplay. It’s an easy to learn, hard to master, high octane, thrill-a-minute ride! “I can’t wait to see gamers gets hands on with ShockRods at EGX Rezzed. Having first worked with the Stainless Games team over 20 years ago, I know first hand how incredibly talented they are so, to partner with them on their latest release is truly fantastic.The fact that ShockRods is going to be shown to the public hands on so quickly speaks volumes about just how confident we are about the game!”.